This is Poster de Luxe! It belongs to our Custom Print series and will be printed individually for you. A certificate with a stamp showing the print date and the printer’s signature is included. The latest printing technique with its 12-color system guarantee that the luminosity and fullness of the colour scheme are outstanding, and the poster will last for many generations. The poster is printed on high quality FSC certified matte paper and will be delivered in our stylish Come to Finland poster tube. After the war, the tourism industry became a big challenge for Finland. Vyborg (Viipuri/Viborg) was lost – the paradise island in the Gulf of Finland, Hogland (Suursaari) was lost, the arctic passage to the Arctic Ocean was lost – and large parts of Lappland’s infrastructure had been burnt down or been obliterated by bombs. However, with gathered strength Finland built the country back up again, and eventually the country was ready to welcome foreign guests. Tourists meant cash and the rekindling of the economy so it was a vital industry. In Europe six years of bans on travel had taken its toll and the desire to have fun and enjoy life was big. 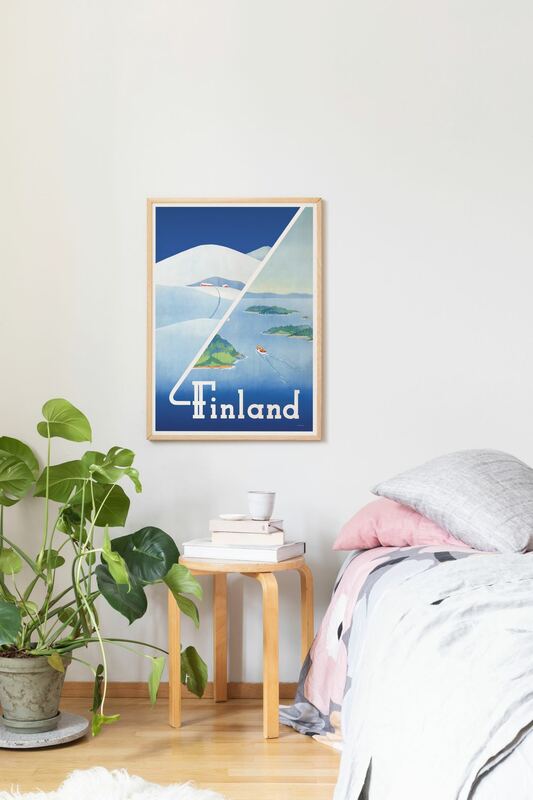 In Erkki Hölttä’s two-part Finland poster the country got its message to the tourists across in a concise way: Finland shall be a travel destination both during the summer and winter. 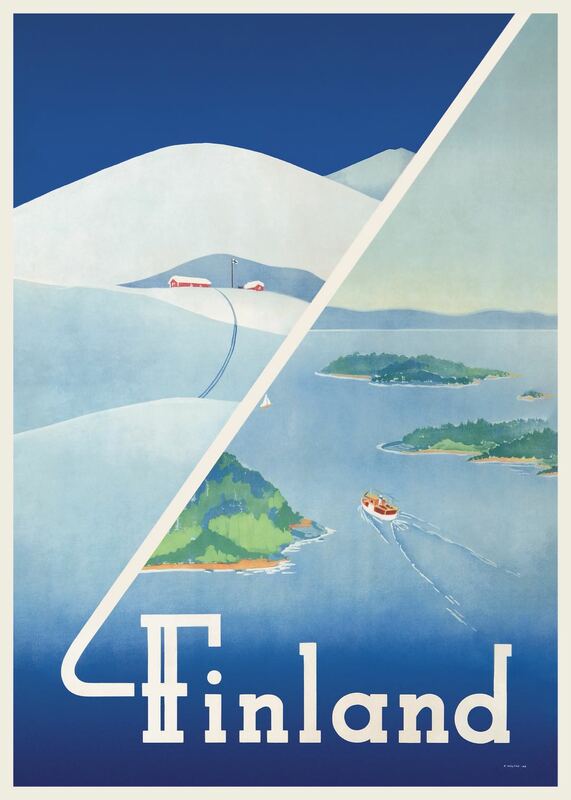 The Tourist Board in Finland was so delighted by Hölttä’s calm and harmonious design that, in 1948, it was awarded the prize for the best Finnish travel poster of the year.